There are arguments for everyone’s household on parenting and raising your fids or kids. I have been doing both for 10 years now, and my opinions have evolved so much that I would probably shout a few choice things at myself even back in the first five years over the way I was doing things. In an effort to be better, I realize that there are no cheap pets. There are no low maintenance pets. There are no Starter Pets. If you get a female guinea pig, be prepared that at some point they may cost you at least $250 in veterinary bills. For their health, they may need spayed. If they live until 4 years, they are more than likely going to need spayed. And be prepared, because they won’t tell you this, but that the oldest guinea pigs were 14 and 15 years old. I can get in line with that, even if you think it’s impossible, because my oldest completely surprised me and lived to almost 8 and 1/4 years. By the way – She needed a spay. Guinea pigs are often referred to as Starter Pets. What child has $250? I might as well add that I never let my step daughter go get guinea pigs in and out of the pen by herself until she was 10. Cats are cheap and easy, right? Kibble, litter, and some don’t even stay in the house most of the time. People even give kittens away for free. Who doesn’t love a free kitten? Getting all the vaccines required under 1 year can end up costing you hundreds at the vet, and under $150 if you know how to play your cards right from other clinics. If you think $50 or $100 is too much to adopt a cat for from the shelter, because you can get a cat for free, please reconsider. It is a value. They are already vaccinated, maybe even microchipped, usually sterilized, and often include a first free vet visit within their network. ADOPT ADOPT ADOPT. I also thought I was perfectly fine feeding kibble until they were seven, and my cat nearly died, a few times. The cats drink from the water fountain, so they’re hydrated. Right? It’s often not enough because did you know that your cat usually won’t drink because it’s casually thirsty? Cats are NOT naturally thirsty. They drink when it’s required, because they are getting dehydrated. My cat’s urine wasn’t dilute enough and he developed a condition that created blockages. He was unable to pee. It was extremely painful, very dangerous, and my boys have both ditched kibble entirely for almost 2 years now. I started doing combination feeding with the girls so that they are eating at least some wet food each day. One lady eats mostly wet food because she loves it, and the other girl has never preferred wet. Not even after over a half dozen dental extractions. Yeah – I also have a cat whose teeth rot out of her head for no known reason. I’m not even getting into the worst of everything. But you know what I’ve found out in the last 10 years? The $450 parrots have been the least problematic. We get along really well, and I get bit often when they decide to have a tantrum. Their main food runs $130 a year. 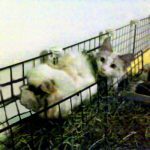 You do have to spend hundreds on a cage, use a helping hand for grooming, they poop on everything, need special lighting. When I started out, I was in my twenties, and I was simplifying everything. I thought this was so manageable. Why did I ever have twelve guinea pigs at a time? I have two now, and that’s enough. The last time I brought a guinea pig home it turns out she was pregnant. I paid the adoption fee for one, and I ended up with 5. Four cats is not easy when two have asthma, one has FORLS, one has FLUTD, and one gets hairballs. I used to let my boys use a free feeder and because I thought that was all I needed to do, my 13 lb boy swelled to 21 lbs, and I had to discipline myself as well as him, and take a few years out to slowly correct it. The girls free feed no problem. Whatever you decide to do to bring joy into your live and make additions to your family, understand that you will eventually come up against the unexpected, and that you made a commitment to give them the best life you possibly can. You may at some point need to be in possession of a CareCredit card CareCredit.com. You may also need to find better ways of saving money. Shop circulars, occasionally take walks through the pet stores you didn’t need to see what they are closing out that month. Compare pricing with Chewy.com. Look at Slickdeals.com . I make the boys’ food now from scratch. It takes 3 hours every month. I do this for a few reasons, and it’s not for everyone. The first thing I learned when I started taking on guinea pigs is that you can do laundry for them instead of buying disposable bedding from the store all the time. Words of wisdom, right there. They also have insurance for pets, which I thought was kind of odd a decade ago. $35 for a cat each month. $420 a year “just in case”. In case of what? I’ll tell you: $10,000. Tommy has run up that amount in vet bills in the past two years. I should have signed him up. Tomas Puma Gargoyle is the prime example. You know who isn’t? His sissy. Princess Yue Pajama Pants has lived with us just as long as he has. The total on her lifetime vet bills, aside from spay and vaccinations? $65. Both cats have been with use since kittenhood and are nine years old. How could I know? Whose side should I be on? Should you get insurance, or should you not get insurance? $10,000 isn’t even Tom’s lifetime total, but Yue’s is $65. These are the big questions. Are you up for it? Are you willing to learn more as they get older and try to change with the times? Do you need a hug? Yeah. Me too. I’ma go hug a kitty.